Type in 'Image #' box a required through page number of the MUSC copy (1-1026) and click on the GO button. Please note that you can see the binding images of the copy by typing in the same box with one of the following numbers: 2000 (for the front board), 2002 (for the spine). Type a signature of the BEN JONSON Folio, from ¶2 to Qqqq4v, without the prefix 'sig.' in 'Signature' box and click on the GO button. Please type [para] for ¶. Please note that you can see the binding images of the copy by typing in the same box with one of the following words: front (for the front board), spine (for the spine). The BEN JONSON Folio has several anomalous signatures. You can search those pages according to the following table, which also includes all the signatures of the preliminaries. Here you can search by titles with the act, scene and line number. 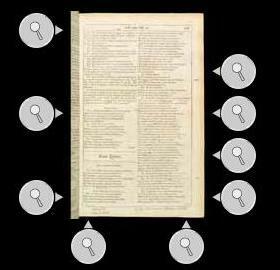 NOTE: The act and scene divisions and the line numbers are based on Ben Jonson, edited by C.H. Herford and Percy and Evelyn Simpson, 11 vols. Oxford: Clarendon Press, 1925-52). Please note that MR 1092-f is not a complete copy. MUSC shows the images taken from another copy coded MR 781 in place of the 18 pages MR 1092-f lacks, viz. ¶2, ¶2v, ¶6-A1v, G3-G4v, M3-M4v and Qqqq3-Qqqq4v. Forward and backward buttons will display the pages immediately before or after the current page. You will see the pages taken from the copy coded MR 781. Please note that not all the annotations are provided with close-ups.